9-6-2011 Basics of Computer Design. Performance Measures. Instruction Set Architecture (ISA) Characteristics and Classifications. CISC vs. RISC, The MIPS64 ISA. 9-15-2011 Exploiting Instruction-Level Parallelism (ILP): Basic Instruction Block, Loop Unrolling. Further Classification of Instruction Dependencies: Dependency Analysis and Graphs. 9-20-2011 Dynamic Hardware-Based Instruction Pipeline Scheduling: The Scoreboard, The Tomasulo Approach. 9-27-2011 Fundamental Dynamic Hardware-Based Branch Prediction Techniques: Branch-Target Buffer (BTB), Single-level, Correlating Two-Level, Gshare, and Hybrid Dynamic Branch Predictors. 9-29-2011 Multiple Instruction Issue, CPI <1 Approaches: Superscalar, VLIW. Hardware-Based Speculation: Speculative Tomasulo. 10-11-2010 Data Parallelism & Loop-Level Parallelism (LLP) Analysis. GCD Test. Software Pipelining. 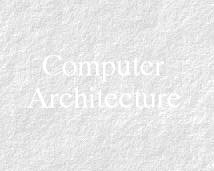 10-13-2011 Review of Memory Hierarchy & Cache Basics (from 550). 3Cs of Cache Misses, Cache Write Strategies & Performance. Multi-Level Cache. 10-25-2011 Input/Output & System Performance Issues. 11-1-2011 The Memory Hierarchy: Main Memory Issues. Performance Metrics: Latency & Bandwidth. DRAM System Memory Generations. Basic Memory Bandwidth Improvement/Miss Penalty Reduction Techniques. The Paper: Each group will write a joint report (~ 6-8 pages) on their research using the IEEE journal format/guidelines/template. DO NOT CHANGE THE TEMPLATE! Take great care in following the guidelines, especially properly citing illustrations, graphs and quoting from their respective sources. The paper is due (hardcopy and electronic) at the beginning of the last day of the presentations. Late submissions will be significantly penalized. Plagiarism will result in a Zero ( see page 18 of the KGCOE 2011-2012 Student Handbook).